Home / Food / Why is drinking too much orange juice bad for you? Why is drinking too much orange juice bad for you? Do you want to know about orange juice, its benefits and side effects? If so, then you need to read this article as it will tell you about orange juice, its side effects and why too much of it is actually bad for you. Actually the liquid extract of the fruit of orange tree is known as orange juice. The orange juice is made when the fresh orange is squeezed and dried and passed through the process of dehydration. Orange juice is also formed when the juice is concentrated and then water is added to the concentrate. There are many benefits of orange juice and one of its major benefits is the high concentration of vitamin C in it. There are different varieties of orange juices available in the market. One of the most popular variety is blood orange. The slang O.J. is commonly used in American English language, which means orange juice. The juice obtained from the mature oranges and their hybrids was named as the official beverage of Florida. Now let us see the nutrients and their amounts present in orange juice. There are about 124 mg of vitamin C in one serving of fresh and raw orange juice. This equals to about 248 grams for 8 ounces. The amount of sugar in orange juice is 20.8 g and the number of calories are 112. Potassium, folate and thiamin are also present in orange juice. Several flavonoids are also present in orange juice, which have many health benefits. The antioxidant hesperidin is also present in orange juice. Orange juice is usually acidic due to the presence of citric acid in it. The pH of orange juice is around 3.5. The American Academy of Pediatrics (AAP) suggest that there should be a balanced intake of orange juices (1). The guidelines suggest that children from 1 to 6 years should consume 4-6 ounces of these orange juices per day and children older than that should consume 8 to 12 ounces per day. These fruit juices can help children get the essential nutrients for their bodies. Following are some of the important nutrients present in orange juices. Vitamin C – Vitamin C is present in orange juice and is a powerful antioxidant, which boosts the immune system of the body. It helps neutralizing the free radicals in the body that damage the cells and tissues of the body and lead to different diseases. Potassium – Potassium is also present in orange juices that plays an important role in proper functioning of the muscles and helps in the reduction of stroke and high blood pressure. Folate – Folate isan important vitamin present in orange juices. It helps in cell division and is quite essential for the healthy growth of red blood cells. Folate helps in the lowering of homocysteine levels in the blood. Cognitive impairment and inflammation can result when the amount of homocysteine in the blood is quite high. Calcium – Calcium is quite beneficial for health and helps in building bones, teeth and muscles. It can also lead to healthier blood pressure levels and can promote good cardiovascular health. Vitamin B6 – Vitamin B6 is also present in orange juices that is quite helpful for the body and helps in producing new blood cells, especially red blood cells. Thiamin – Thiamin is also a major component of orange juices. It helps with the action of different enzyme systems. It converts the food into energy and helps in the repairing and production of DNA in the body. Orange juice is usually filtered and pasteurized before it is evaporated with heat. The concentrated juice which is formed is stored at a temperature of 10 degree F. The amount of sugar in orange juice is 65% by weight. Vitamin C and oil are extracted during the vacuum concentration process. They are again added afterwards to restore the nutrition and flavor. Water is actually reconstituted when it is added to the freshly concentrated orange juice. Orange juice was first commercially developed in 1948 in the University of Florida’s Citrus Research and Education Center. It has become quite a popular commodity product after that time. There have been many future contracts since 1966 in the New York. There were different competitors of Florida Orange Juice Company in 1985. This product had the greatest orange juice share in the market from 1950 to 1980. This juice Company was surpassed by not-from-concentrate juices in the 1980s. Now let us see what is meant by “not from concentrate”. “Not from concentrate” is the juice which is passed through the process of pasteurization and then given to the consumers without passing through the concentration process. The natural flavor of the juices is reduced by most “not from concentrate” processing. A production process is used by most “not from concentrate” producers. The juice is placed in the aseptic storage during the production process and oxygen is taken away from it for about a year or so. The compounds which give flavor are also removed when oxygen is taken away. This is the reason why the manufacturers usually add a flavor pack in the last step. Different regions have different flavor pack formulas because there are diverse people in the world and different people have different preferences regarding freshness and sweetness. The Citrus Industry says that the Food and Drug Administration doesn’t need the contents of flavor pack to be displayed on the product. Ethyl butyrate is one of the common component of the flavor packs. It is actually a natural aroma which is quite fresh and removed from juice during the storage process. The team of the magazine “Cooks Illustrated” sent these juice samples to different laboratories. The results from the laboratories showed that there were about 1.9 milligrams of ethyl butyrate per liter in freshly squeezed orange juice. But the juice which was commercially prepared had a higher level of ethyl butyrate per liter in it, which was about 8.53 milligrams per liter. Orange juice is also sometimes available in canned form. More vitamin C is present in the canned juice as compared to the bottled juice. The flavor of a canned product is lost when it is stored for more than 12 weeks at room temperature. There was a kind of metallic taste in the canned orange juice during the early years of its release. The most probable reason behind this is the high acidity of the juice. Flash pasteurization process was developed by Dr. Phillip Phillips in 1931, which ended this problem of orange juice, which in turn increased the market value of canned orange juice. The closest thing to eating an orange is consuming the unpasteurized and freshly squeezed orange juice. These kind of juices are squeezed and then bottled without adding any kind of flavors or additives. The juice isn’t passed through the pasteurization process. The life period of a fresh juice is about 12 days. Now let us look at some of the orange juice brands. Tropicana Products is currently the most famous juice brand in the USA and owns about 65% of the market share. It is also popular in central Asia and Europe. Some other products in the market include Florida’s National and Minute Maid. Daily Juice is a popular juice brand in Australia. Del Monte and Princes are the major orange juice brands present in the United Kingdom. Ascorbic acid and citric acid are commonly added to the orange juice by most producers. Some other nutrients like additional vitamin C are also added. Omega 3 fatty acids are also sometimes added to orange juice. There are also many varieties of orange juice present in the market. Evaporators are mostly used by most juice producers for removing water from the juice. The main reason for doing this is to reduce the weight of the juice which in turn reduces the cost of transportation. The producers of orange juice add the taken compounds afterwards in a proprietary mixture known as proprietary mixture because the aroma compounds are removed which give the orange juice a unique taste. This is done actually in order to ensure that the orange juice has a unique taste and to make sure that the taste remains consistent throughout the year. The compounds which are present in the flavor packs are actually obtained from the orange peels. Most producers don’t mention on the label of orange juice that they have added flavor packs in it. Now let us see the different types of orange juices. Common orange juice is made from sweet orange. There are different properties of different cultivars and the orange juice is mixed by the cultivars to get the desired taste. The color of orange juice is usually between shades of yellow and orange. Some ruby red varieties are pink in color and some are even reddish-orange. The reason for this is the different pigmentation in ruby red oranges. The Vitamin C content in it is 240% and the vitamin E content is 100%. Antioxidant properties are present in Vitamin E and C and they help in protecting the cells of the body against oxidative stress. However recent research has shown that there isn’t much benefit given by this type of orange juices. The American Heart Association has even recommended not to take them at all. Different clinical trials have shown that the cancer and heart failure risk of a person increases when high doses of Vitamin E are consumed. So, this research suggests that there isn’t any reason for people to consume orange juice. The Vitamin D content in this orange juice is 25% whereas the calcium content is 35%. Many Americans don’t get enough quality of calcium and Vitamin D in their bodies. These two nutrients are quite beneficial for the body and protect the heart and prevents certain types of cancer. One 8 ounce glass of this juice has about as much as calcium as a glass of skim milk. 100 international units of Vitamin D are also present in it. Current researches have suggested that the current Daily intake value of calcium D, which is about 400 IUs, is too low and it should be 800 to 1,000 IUs. Therefore, people should definitely consume orange juice to increase the intake of Vitamin D in their body. No daily value is usually recommended for omega 3. The American heart Association suggests that people should take about 3 ounces servings of fish per week. There are about 50 milligrams of Omega 3 in the juice. When a person drinks an 8-ounce glass seven days per week, he would get a third of a serving of fatty fish. The AHA suggests that about 1000 mg of omega 3s per day should be the aim of people suffering from heart diseases. There are half number of calories in this juice as compared to others. The reason for this is that it is about 60% water. There is also less intensity of the orange flavor than regular OJ in it. An artificial sweetener is also present in this drink. This is quite a famous type of orange juice. The place of origin of these juices is the USA and Brazil. The sugar content in these juices is 22 grams. It has a nice and bright flavor with good acidity. It is a bit disconcerting and it gives the intense flavor without the presence of pulp. It has a good orange flavor in it. It isn’t too much acidic but is pleasing and mild. It feels thicker than the others. It is pleasant in taste but not altogether different. This is another popular type of orange juice. Its place of origin is Florida and Brazil. The sugar content in it is 22 grams. It has the closest taste to that of freshly squeezed orange juice. It is sweet and has a strong flavor. It has been reported that at first it tastes just like candy, but tastes good after that. It is super smooth. The place of origin of these juices is Florida. The amount of sugar content in these juices is 22 grams. It has a good aftertaste. It is thicker in texture as compared to other juices. It is also standard and mellow and pretty good in taste. The place of origin of these juices is Florida. The amount of sugar in these juices is 22 grams. The taste isn’t that much exciting but is harmless. It has a nice sweetness to it. It is quite flavorful and acidic in taste. The taste is quite sweet and sour at the same time. This is also a popular type of orange juice. The place of its origin is USA and Brazil. The sugar content in it is 22 grams. It has a good acidity in it. There is a good balance of acid and sweetness in it. It also has a pleasant and bright flavor. These are another popular type of orange juices whose place of origin is Florida. The sugar content in it is about 24 grams. It has an almost creamy texture, but isn’t that much sweet. It can be quite refreshing for a large audience. The place of origin of these orange juices is Florida. The sugar content in it is 22 grams. It is sweeter in taste and is more complex as compared to other fruit juices. There is a slight citrus notes in these juices. It has an off-taste in it which doesn’t taste like oranges. It has a specific sweetness in it. The place of origin of these fruit juices is USA and Brazil. The amount of sugar in these juices is 22 grams. These are quite thin and watery. Its taste is a bit like its container. It has a slightly different taste but a person gets used to it with time. But still it doesn’t taste like 100% orange juice. These are popular Florida orange juices. The amount of sugar in it is 22 grams. It is slightly acidic but the taste isn’t that much bad. It has a taste just like fruit punch. It tastes just like its container and is extra sweet. The amount of calories and sugar obtained from orange juice differs greatly and it mostly depends upon the amount you have at one time. As an example consider a 4oz serving of orange juice. There are 12.9g carbohydrates and 56 calories in it. A 16-oz orange juice on the other hand has 223 calories and 51.6g carbohydrates in it. So basically orange juice isn’t that much a good source of fiber in comparison to whole fresh oranges. Orange juice has low glycemic index levels. This basically means that the blood sugar of a person is raised slower as compared to high-glycemic foods like candy and potatoes. This is absolutely fine when orange juice is consumed in low quantity. But the problem is that most people don’t get satisfied with a small serving of orange juice; they drink large servings of orange juice which causes the glycemic load and a lot of carbohydrates intake at once which heighten the blood sugar level. The glycemic load of 4-oz. serving of orange juice is 5.9 whereas the glycemic load of a 16 oz serving of orange juice is 23.7. A glycemic load between 1 and 10 is considered low, between 11 and 19 is considered moderate and above 20 is considered high. A high glycemic load can quickly elevate your blood sugar level. One major side effect of drinking too much orange juice throughout the day is inconsistent energy levels. Drinking orange juice too much and on regular basis can fluctuate your blood sugar level. A person feels energetic after gulping a glass of orange juice. But the energy level drops when the blood sugar level drops. One of the major side effects of consuming beverages with a high glycemic index is that they can increase your weight and make you obese. A small serving orange juice isn’t satisfying for the body because it doesn’t contain any fiber. Blood sugar levels can suddenly drop due to the consumption of large amount of orange juice. This makes you eat more food and carbohydrates which results in weight gain. Pregnant women should avoid the consumption of too much orange juice. They should drink orange juice in moderation. Some people suggest that orange juice is beneficial for pregnant women because it contains fiber in it. But the truth is that excessive consumption of orange juice can do more harm than good. Gastrointestinal discomfort and heartburn can result when orange juice is consumed in excess. Our teeth are covered with enamel that is made out of calcium. It’s ironic that teeth are one of the strongest things in nature and survive even after thousand years of decay, but can’t survive acidity for much long. Acidic substances react with the calcium of enamel and cause its deterioration. This is how eating too much sugary foods can destroy your teeth. The sugar in foods acts as a great source of nutrition for bacteria residing inside your mouth. These bacteria use this sugar and convert it into acids, which then harm the teeth. Orange juice, despite all its goodness, has both the evils that destroy our teeth i.e. it’s a little too acidic and it contains a good amount of sugar in it too. That’s why drinking too much orange juice takes away the integrity of your teeth and can increase the chances of dental carries and related teeth problem. Orange juice might not be that bad if you’re drinking it fresh and natural, but that is not going to happen in today’s society where everything is highly processed. Everything you buy from a super market may be labeled “all natural” or “all pure”, but the truth is far more dreadful. Can you imagine a natural thing with shelf life of months? If you don’t know, most of the natural and organic things have extremely low shelf life- not more than a few weeks. What most manufacturers hide from you is the addition of a lot of chemicals and additives that give the orange juice its aroma, color and taste. Taking one or two glasses of these drinks daily may not harm you, but when taken in excess, these chemicals can certainly damage your body organs, especially the kidneys. So, do read the labels before taking the gulp of your favorite orange juice. Citrus fruits have always been hailed for their high levels of vitamin C. Among all the citrus fruits, oranges are known to have the highest levels of vitamin C. Vitamin C is an extremely important body nutrient as it is needed for the synthesis of collagen and body tissues. Moreover, it is also needed for proper wound healing and blood clotting. But, that’s only one side of the picture. Things take a rather drastic turn when you drink too much orange juice and your body gets too much vitamin C. Getting more vitamin C than what your body requires can result in vitamin C toxicity (2, 3). Vitamin C toxicity first manifests in the form of stomach upset and increased abdominal cramps. The situations gets much worse if you overlook these symptoms and continue consuming too much orange juice. You may end up getting kidney stones because of vitamin C toxicity. Vitamin C increase the acidity of your urine and also increases the concentration of oxalic acid in your urine. Both these factors are optimum for increasing the chances for the formation of oxalic acid stones in your kidneys (4). Under normal conditions, vitamin C is needed for the proper absorption of iron in the small intestine. Vitamin C is involved in the redox reaction through which iron is converted from its non-absorbable form into its absorbable form. That’s how normal body system work. But things are very different when you’re overloading your systems with vitamin C (5). Very high amounts of vitamin C can increase the absorption of iron in your body too. Increased iron absorption can increase the chances of iron toxicity. The dangerous thing about this condition is that iron toxicity is slow to develop and takes some time before you can know what your body has been through. By the time you’re aware of the condition, a lot damage has already been done. Some important side effects of iron overload include liver damage, kidney damage, damage to your pancreases and even brain. If you’re a patient of thalassemia or hemochromatosis then use of orange juice is a big NO for you. 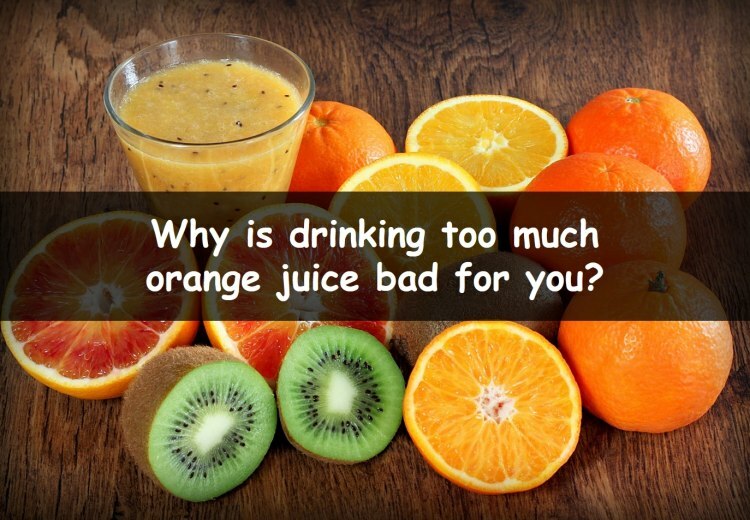 It’s because too much orange juice can increase iron levels in your body. In both these diseases, the concentration of iron in body increases substantially. If you’re consuming vitamin C, you’re further overloading your struggling body systems with more iron. Do consult your physician before using orange juice in these conditions. Vitamin C is known to interact with tens of drugs. It has the ability to increase or decrease the effectiveness of these drugs. Therefore, you should be very much caution while taking vitamin C while using drugs as may increase the chances of drug side effects. Some drugs that are known to interact with vitamin C include aspirin, metformin, fish oils and multivitamins (6). Vitamin C is known to cause deficiencies of several trace minerals in the body. Vitamin C does that either by decreasing their absorption from the gut or by increasing their excretion from the kidneys. Some of these nutrients include zinc, manganese and copper. Under normal conditions, an adequate supply of vitamin C is necessary for maintaining normal supply of calcium in the body. In other words, an adequate amount of vitamin C has positive influence over calcium metabolism. But, if you’re overloading your body with vitamin C, you’re putting more pressure on your bones to release more and more calcium. This can ultimately lead to increased risk of osteoporosis (7). Some other side effects of consuming too much orange juice include mouth ulcers, vomiting, face redness, insomnia, back pain, copper deficiency, vitamin B12 depletion, dental cavities and back pain. This article has informed you about orange juice, the substances contained orange juices, various types of orange juices available on the market and side effects associated with excessive consumption of orange juice. The bottom line is that drinking orange juice is generally beneficial but you need to be careful when taking medicine (due to risk of various interactions), when you are pregnant or suffering from conditions like thalassemia or hemochromatosis. Also orange juice should not be your only daily drink. If you have any further questions or are not sure whether drinking orange juice is good or bad for your health, always ask your physician for advice.